We’d love your help. 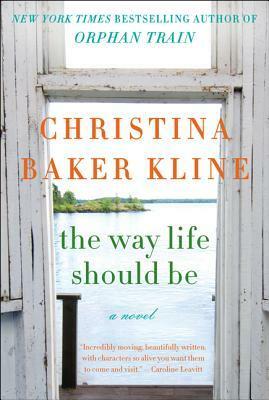 Let us know what’s wrong with this preview of The Way Life Should Be by Christina Baker Kline. From the #1 New York Times bestselling author of Orphan Train, and the critically acclaimed author of Bird in Hand, comes a novel of love, risk, and self-discovery—includes a special PS section featuring insights, interviews, and more. Angela can feel the clock ticking. She is single in New York City, stuck in a job she doesn’t want and a life that seems to have, somehow, j From the #1 New York Times bestselling author of Orphan Train, and the critically acclaimed author of Bird in Hand, comes a novel of love, risk, and self-discovery—includes a special PS section featuring insights, interviews, and more. To ask other readers questions about The Way Life Should Be, please sign up. 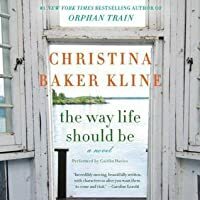 I've devoured all of Christina Baker Kline's books - back to back - starting with Orphan Train and just about finished The Way Life Should be, which is also delicious! Does she have another in the works? Any recommended reads along Kline's lines? I signed this book out of the library because I remembered really liking an earlier book by the author (Sweet Water). This one starts off feeling like a fairly predictable chick lit book but gets better as it goes along. In fact, I sort of wish it had kept going. I got to the point where I felt like I was just getting to know some of the more peripheral characters and then it was done. Christina Baker Kline has a very readable, transparent writing style, spot-on dialogue, and characters I feel like I know. Angela Russo is a single, thirty-something event planner in New York. When an important charity event goes all wrong, she loses her job. She impulsively decides to move to Maine to pursue a new relationship with a sailing instructor she met on an online dating site. She befriends the owner of the local coffee shop and ends up working for him, convincing him to expand his bus Christina Baker Kline has a very readable, transparent writing style, spot-on dialogue, and characters I feel like I know. Angela Russo is a single, thirty-something event planner in New York. When an important charity event goes all wrong, she loses her job. She impulsively decides to move to Maine to pursue a new relationship with a sailing instructor she met on an online dating site. She befriends the owner of the local coffee shop and ends up working for him, convincing him to expand his business and offer baked goods and soup. That gives her the chance to reconnect with her love of cooking, a skill she learned from her beloved Nonna. This enjoyable read can be summed up as a sweet (if predictable) find-yourself story with just the right touch of romance and recipes. Wow, Christina Baker Kline has really evolved from this (one of first novels) to her critically-acclaimed follow ups Orphan Train and a A Piece Of The World. Hmmmm. That sounded like a back-handed compliment. And it’s not meant to be; I’m just really impressed at how much she’s matured as a writer over the course of a few books. Again.... unintentionally back-handed. There was nothing wrong with this story at all: it’s a simple, heartfelt tale about... well, the way life should be. It’s got roma Wow, Christina Baker Kline has really evolved from this (one of first novels) to her critically-acclaimed follow ups Orphan Train and a A Piece Of The World. Hmmmm. That sounded like a back-handed compliment. And it’s not meant to be; I’m just really impressed at how much she’s matured as a writer over the course of a few books. Again.... unintentionally back-handed. There was nothing wrong with this story at all: it’s a simple, heartfelt tale about... well, the way life should be. It’s got romance, recipes and retrospection. An Under The Tuscan Sun in Maine... during winter. And it couldn’t have come at a better time. There was something about the tale that really resonated and inspired me (Not dating sketchy men from the Internet—I did enough of that in my 30s—but removing oneself from the grind, and making an effort to unplug and really be in the moment). I'm a total sucker for books about food. (Mmmmm...and Italian food?!) Add in the whimsical ideal of ditching a busy, rote life, running off to a small romantic town (in gorgeous Maine!) to simplify, sort out what's important, and start over....and I'm hooked! What an engaging escape novel with relatable characters and some particularly funny dialogue. I dug it! After reading Orphan Train( which was amazing ) I wanted to read more of Christina Baker Kline! This was a very nice , quick read - you can pretty much predict what was going to happen- but all in all a good read. Main character Angela, faces the real struggles you would expect from a journey of self discovery. Kline captures the charms of life in Coastal Maine beautifully and is able to make the harsh winters seem warm and cozy through her writing. A nice chick-lit book for sure! I started reading this book, then put it aside, the first part was more like a Harlequin romance novel. Then I decided to give it another try and about halfway through, it got much better. If the whole book had been like the last half, I would have given it another star, because the second half was an engrossing and enjoyable read. Recipes included. Really loved this well told story of a young woman trying to find her "soul mate" and figure out what direction her life should go in. Wonderful descriptions of the art of cooking and the love of good food, relationships, the beautiful Maine coast in winter. So lovely except I felt the ending fell short - sort of abrupt the way the book ended, as is the author just got tired of writing and decided to move on to another project - she left us hanging. I really wanted to know what happened to Angela Really loved this well told story of a young woman trying to find her "soul mate" and figure out what direction her life should go in. Wonderful descriptions of the art of cooking and the love of good food, relationships, the beautiful Maine coast in winter. So lovely except I felt the ending fell short - sort of abrupt the way the book ended, as is the author just got tired of writing and decided to move on to another project - she left us hanging. I really wanted to know what happened to Angela, her family and friends and was disappointed he the author didn't take us a little further along in her journey. Well written and interesting about Italian cooking and a young woman's search for companionship in the coast of Maine. A good story, but somewhat slow. Loved loved love made me want to run away AGAIN to Maine. This read was a fresh breath of air from the psychological thrillers I have been reading. Every once in awhile it is good to take a step back and read a story that just causes you to inhale a bit deeper - enjoy the feel and energy of oxygen as it pulses through your being and reinforces that you're still alive. Sometimes we get so caught up in our day-to-day living and trying to fill the agenda we have laid out for ourselves that we forget to enjoy the simple pleasures in life like an afternoon This read was a fresh breath of air from the psychological thrillers I have been reading. Every once in awhile it is good to take a step back and read a story that just causes you to inhale a bit deeper - enjoy the feel and energy of oxygen as it pulses through your being and reinforces that you're still alive. Sometimes we get so caught up in our day-to-day living and trying to fill the agenda we have laid out for ourselves that we forget to enjoy the simple pleasures in life like an afternoon spent sipping coffee or tea with a friend and just laughing; the pleasure found when you taste a hearty homemade soup on a cold winter's day or the sound of leaves as they crunch under foot in the Fall. Angela lives in New York surrounded by her father and step-mother, her brother and his family and her loving Italian grandmother. She is in her 30's and still trying to decide where her life is headed and if there is someone out there with whom she can share her life. She has always dreamed of living up the New England coast with visions of pretty white cottages, crashing waves and the smell of sea air. When a friend suggests she join a dating site she reluctantly gives in and was completely pulled in when a man from Maine answers her ad. As you can already predict, she eventually finds herself in Maine with the hope and anticipation that she has found her soul mate. Enough about the story -- you've got the picture. While I enjoyed the subdued story of her "coming of age" at 30+, I enjoyed even more the warming descriptions of Italian meals simmering with flavor and scents that warm the soul as much as the body. I enjoyed the stories of the people who found themselves inhabitants of the quaint community -- whether by choice or circumstance. Most, however, I enjoyed the appeal and picture painted of a life lived slowly -- without a direction written in stone and without a foregone conclusion -- of a life lived a day at a time and eyes that can behold the beauty of the sky with and without stars. Life should never be a scripted journey. Life should be lived with a sponge in hand to absorb all it has to offer. Life should be lived with a pursuit of happiness in mind, but the strength to overcome obstacles when they come our way. Living a "life" is the one opportunity each of us are given to pursue our dreams, make a difference, set our own pace and define "what will be". Living out OUR choices and not those of another, making ourselves happy and not relinquishing that right to someone else to do, now that's "The Way Life Should Be". I almost quit reading this book so many times, and finally just skimmed ahead until the cliche chick-lit parts were mostly over. The beginning chapters are pure cliche: the heroine is unlucky in love, epically screws up her job, risks her job in pursuit of a guy . . . but luckily, she has a Special Gift and Unique Cultural Background! Sigh. Other reviewers were right, though - once in Maine, it got a lot better and there were some very nice chapters about food and community and community and foo I almost quit reading this book so many times, and finally just skimmed ahead until the cliche chick-lit parts were mostly over. The beginning chapters are pure cliche: the heroine is unlucky in love, epically screws up her job, risks her job in pursuit of a guy . . . but luckily, she has a Special Gift and Unique Cultural Background! Sigh. Other reviewers were right, though - once in Maine, it got a lot better and there were some very nice chapters about food and community and community and food. And then it ended without really going anywhere. This was a good "summer" read. A kind of cornylove story but had some great Italian recipes I want to try. I was surprised how quickly I arrived at the final page of this novel, first in an annoyed, then in a grateful way. Caught up in the culmination of emotions and possibilities for the main character, Angela Russo, the story ended before I was ready. Even if there was so much more to explore and be discovered through the lives of these believable and varied characters, I appreciate (quite ironically) that this is "the way life should be". Some readers are drawn toward reading a story where everythin I was surprised how quickly I arrived at the final page of this novel, first in an annoyed, then in a grateful way. Some readers are drawn toward reading a story where everything is tied nicely with a bow at the end, as am I. However, every so often, a story comes along that doesn't *need* that. And perhaps, what it really needs is exactly what it provides, an open-ended hope for beautiful things on the horizon. When I finish a novel that makes me ponder my own life while sensing an emotional connection with the characters as if they're a part of my own family, I am grateful. Aligned with my own philosophy as an author, this well-crafted story provided a path to not only escape reality, but also to help navigate it. The recipes at the end of the book *will* make an appearance in our kitchen. I found my stomach grumbling with supplication at the savory Italian flavors. Even more interesting and welcome was the interview with the author at the end of the book. It is always a pleasure to gain some personal insight and peek behind the curtains at the life, motivation, and thoughts of an author. This is the fourth Baker Kline novel I've read. They are each remarkably different from each other. That in itself is unusual. Most authors follow a "type" and their voice gives a constant likeness. Not so Kline. I enjoyed this so much, and in thinking of the characters, realize I feel that I know each very well, even though most had very little page time and little dialogue. There's a frequent undercurrent of humor, and the protagonist is searching. Who is she? Who and what does she want to be? This is the fourth Baker Kline novel I've read. They are each remarkably different from each other. That in itself is unusual. Most authors follow a "type" and their voice gives a constant likeness. Not so Kline. I enjoyed this so much, and in thinking of the characters, realize I feel that I know each very well, even though most had very little page time and little dialogue. There's a frequent undercurrent of humor, and the protagonist is searching. Who is she? Who and what does she want to be? Where does she belong? Chick lit but this is an early book for the author. I could see a bit of historical fiction. Most of her later novels are in the historical style which she does well. I’ve always told my students that authors never give their characters the age of thirty-three accidentally. That is a purposeful age, heavy with allusion. Jesus was thirty-three when he was crucified, and ever since, the age has tremendous literary (not to mention religious) symbolism. When a writer tells us that a character is thirty-three, we must expect cataclysmic, significant changes to occur. She’s also a woman desperate for – even if she isn’t perhaps aware of I’ve always told my students that authors never give their characters the age of thirty-three accidentally. That is a purposeful age, heavy with allusion. Jesus was thirty-three when he was crucified, and ever since, the age has tremendous literary (not to mention religious) symbolism. When a writer tells us that a character is thirty-three, we must expect cataclysmic, significant changes to occur. She’s also a woman desperate for – even if she isn’t perhaps aware of just how desperate – change. She works as an event coordinator for an art museum, a job she didn’t choose for herself and is not particularly content with doing. She lives alone, and all of her friends are pairing up. She is not leading the life she thought she would lead. So when she joins a dating website on a whim and sees “MaineCatch,” she’s intrigued. Who is this man with these New England interests? She’s had a photo of a cottage in Maine stuck to her wall for years. Doesn’t that mean that MaineCatch is her SOUL MATE? Like all good thirty-three-year-old single women, Angela knows an opportunity when one presents itself, so she meets Mr. MaineCatch – aka Richard – and the two share a passionate evening together. Yes, our Angela rocks that headboard on her first date. Angela eventually winds up in Maine on the pretense of hanging out with Rich. You know, long before she does, that he is not exactly Soul Mate material. But he’s fun and good in bed, so what’s wrong with a little dalliance. Angela finds herself drawn to the Maine lifestyle, though, and soon she finds herself becoming a part of the quirky island town she intended to merely visit. In search of her passion, Angela begins devoting more and more time to cooking, a skill she learned at the feet of her Italian grandmother. Feeding others continues the Biblical allusions: Jesus fed all those people on loaves and fishes, you know, and his first miracle was turning water into wine. Food nurtures us. It heals, and preparing it can also be healing. Angela is the sort of character you enjoy reading about. Christina Baker Kline writes her heroine realistically and lovingly, not shying away from Angela’s flaws and weaknesses. Angela loves deeply, whether her family, her friends, or potential soul mates – sometimes to a fault. She allows herself to be blinded by what she doesn’t want to see, just as she allows herself to be victimized by her fears. She’s like any one of us, really. The cooking motif reflects Angela’s developing sense of self. Her grandmother does not follow a recipe, certainly not one that dictates that women be married by thirty and a mother shortly thereafter. Nonna cooks by feel, letting her experiences with different foods guide how she prepares them. So it is with Angela, who follows no predetermined script, instead using her prior knowledge to influence her decisions. She experiences with a little of this, a little of that. When one ingredient doesn’t work, she replaces it with one that might. Can Angela find love in Maine, or is she destined to return home to continue with Nonna’s tutelage? She dreams of opening a restaurant, but can she do it? Will she? She’s thirty-three. And she’s ready for the changes that life brings. Baker Kline sprinkles recipes throughout the book, so between those and the food scenes, you will be hungry. The good news is that Angela and the cast of characters will fill you up, or at the very least warm you. This is a delightful, lovely book. I was excited to get an email advertising another book by Christina Baker Kline. I had read Orphan Train and loved it and recommended it to many friends. In this novel we meet Angela, a 33 year old event planner living in NYC. After a major mishap at one of the events that she has planned, she loses her job. At the same time, Angela has started to use online dating and has recently met a man from Maine, who seems to good to be true. When she tells him that she has lost her job, he casually invite I was excited to get an email advertising another book by Christina Baker Kline. I had read Orphan Train and loved it and recommended it to many friends. In this novel we meet Angela, a 33 year old event planner living in NYC. After a major mishap at one of the events that she has planned, she loses her job. At the same time, Angela has started to use online dating and has recently met a man from Maine, who seems to good to be true. When she tells him that she has lost her job, he casually invites her to come to visit him for a vacation. Ready for an adventure in her life, Angela packs up her belongings and goes off to Maine. Winter is starting to set in and Angela is in a small town where she knows no one. The sign she saw when she entered the state of Maine said, "Maine - the way life should be" But is it? Angela is about to find out. I was very engaged in the story since I have a daughter who just moved to NYC. Christina lives in my hometown, Montclair, NJ and I enjoyed reading about the area where I grew up. Just like Angela and her friend, I took the same route to Willowbrook Mall. Although I don't typically like "foodie" books, the descriptions that Christina wrote pulled me right in and made me feel as though I could smell the food cooking! This is a hard book to review. The first few chapters are painfully bad, and were I to stop there, it would have gotten a very bad review indeed. It does pick up from there, and is a bit charming in places, and then it sort of stops, on a vaguely optimistic note granted, but without much of an arc. I found this book in a "take one, leave one" bookshelf at the cottage we stayed at in Maine. Mostly taking place on the same small island where we were vacationing (Mount Desert Island, home of Acadia National Park), this was a perfect vacation read. I also loved the recipes dotted throughout the book. Good story. Ends too soon. Angela matures over the three months of this well-written story, and I was happy to see that there was still 15% left in my book when it suddenly ended. I don't cook so the pages of recipes at the back weren't my thing. I wanted more of Angela's journey, her life in Maine. Still, I enjoyed the developing of the relationships and laughed at the humor. A good book. The story was a pleasant surprise. Angela Russo is a 30-something who loses her job as an event planner and impulsively moves to Maine at the end of "leaf peeping" season. She meets an interesting group of people and her life begins to revolve around her love of cooking which she learned from her grandmother. There were some funny scenes and some poignant scenes - just the right balance to keep me going. 1. The author did not include stereotypes of the lovely citizens of Maine. She focused on the openness and acceptance of each other but not the negative, stoic stereotypes that can appear. 2. Angela's relationship with her grandmother was wonderful. Having married into a family with grandparents who were immigrants, I saw first-hand that sharing of generations and the life-long effects of the grandchildren. I don't know if there is a follow-up to this story; I'm not sure that there needs to be one. I certainly do look forward to reading more by this author. 3.5 The first 20% is pure chick lit, but it evened out and the story improved to heartwarming end.